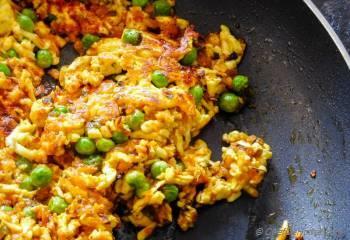 Scrambled Indian Cottage Cheese (paneer) cooked in Indian spices, aromatics, tomatoes, and green peas for a hearty vegetarian main course, for your next Indian Dinner at home! 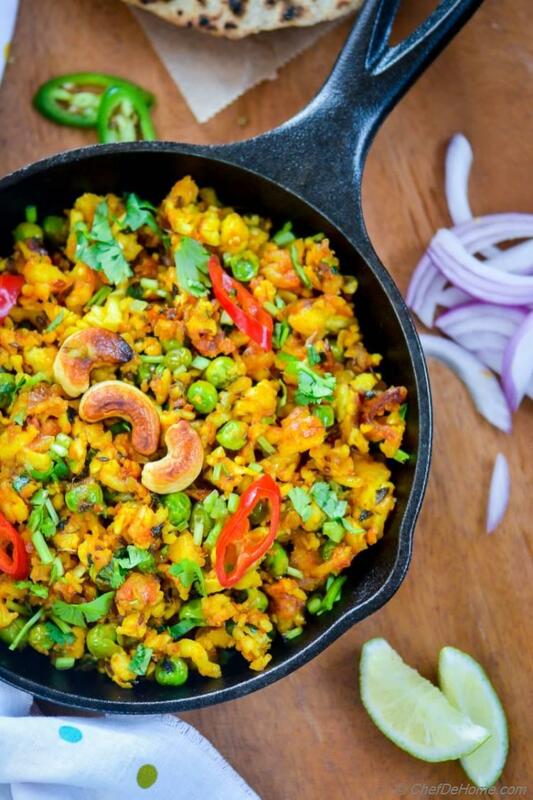 This crispy, authentic, Indian Punjabi Paneer Bhurji will be everyone's favorite on Dinner Table! I promise! Indian Paneer (Cottage Cheese) is one of favorite kind of fresh cheese often used in a lot... I mean, A LOT in Indian cuisine! Indian Paneer is fresh and sturdy cheese which does not melt like aged cheeses and maintains it's shape when cooked in high heat. So..... you guessed it, it is used as 'Vegetarian Alternative' in almost every Indian Curry/Gravy! Hence, the demand! 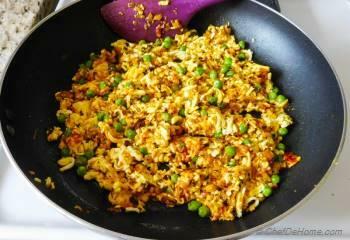 Paneer Bhurji I'm sharing today is one such recipe which will be no strange to any North Indian. 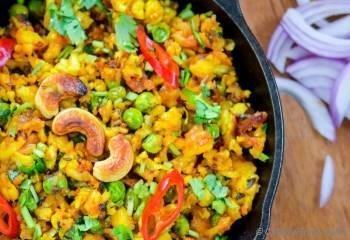 This vegetarian main course has got it's name from Indian style Scrambled Eggs - Egg Bhurji. 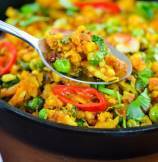 Being North Indian Punjabi, I can tell you, the only thing we look for when eating a classic bhurji, whether egg bhurji or paneer bhurji is: crispy texture and aroma of spices! Growing up, I ate lots and lots of Paneer Bhurji. This dish is rated 5 on scale of 1 to 5 in ease to cook, taste, and keep-whole-family-happy! :) Whenever family was in mood of Vegetarian Dinner, Paneer Bhurji used to be "The First Choice"! 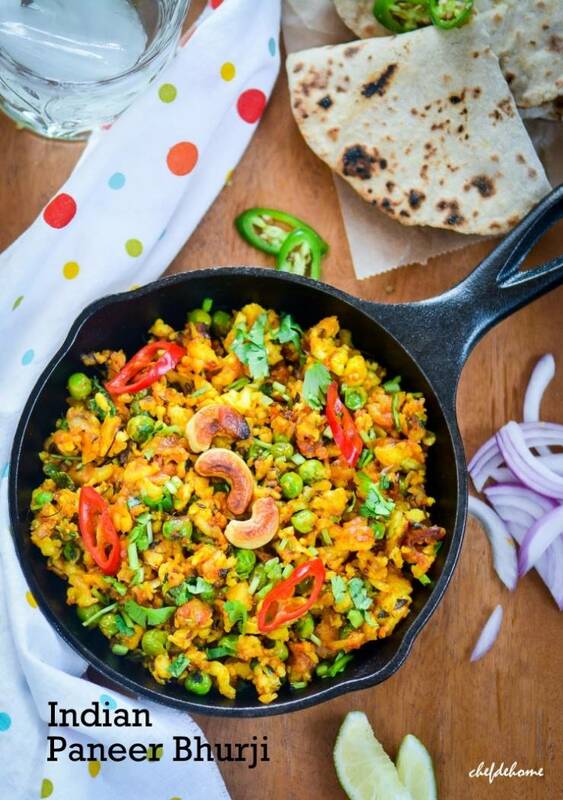 1) Crispy Bhurji: Once paneer added to pan, don't hustle with it too much. Let water evaporate and paneer cook on it's own. Just mix paneer with spices, then spread in even layer, as much as possible. Leave it to cook for 3-4 minutes or until paneer crisp from bottom. 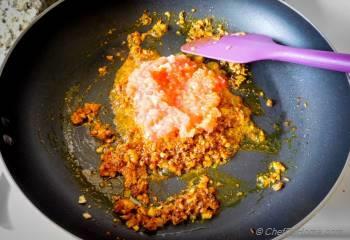 Then flip and if you like leave for other few minutes for more crispy paneer bhurji. 2) Dhaba style Aroma: For that signature, dhaba style aroma, don't skimp on asafoetida and kasoori methi. Even though used in small quantity, these two can make or break the authentic taste of real Punjabi Paneer Bhurji. 3) Fresh Homemade Paneer: If using fresh homemade paneer, leave it one kitchen counter with some weight on top to drain water, as much as possible, otherwise paneer bhurji will not get crispy. Or leave fresh paneer in refrigerator for a day. A day old paneer works best for Paneer Bhurji. Even though we are not vegetarian, there are many days in week when we don't eat meat. On such days, I often make North Indian vegetarian curries for dinner and Paneer Bhurji is always on menu. After marriage, when we both were working...... often, our schedule stretched to very late evenings. (IT Jobs are famous in long working hours.) Sometimes, it used to be SO late that there was no scope to come home and cook. Earlier, I used get very tense at thought of cooking whole meal in 20 minutes and serving dinner! Hence, someday we had no option but to eat out! But..... slowly, I started making a list of easy dinners ideas which I can serve at moment's notice. Clearly, this was the time, when my interest in cooking grew 10-folds! Indian Curry Masala (Indian spices cooked with onion and tomatoes) is very common, every-day-use masala, in Indian Cuisine. If you can learn to make this masala (step 1 - 4 in recipe below), you can use it for 50% of easy Indian main course recipes. So, I used to make fresh paneer and keep ready in refrigerator on weekend and also make a batch of Curry Masala. When we returned home from work, in one pan, I would cook masala with Indian paneer and peas, and make roti or rice in meantime. Believe me, in less than 20 minutes, dinner would be severed! A real moment of hurrah! trust me! 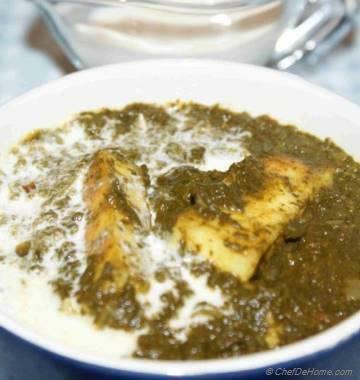 I'm sure you will like this little authentic taste of my Punjabi heritage! Total Time 25 minutes Prep Time 10 minutes Cook Time 15 minutes Difficulty Easy Yields 4 Servings Serves 4 Notes No. of servings depends on serving size! 1. 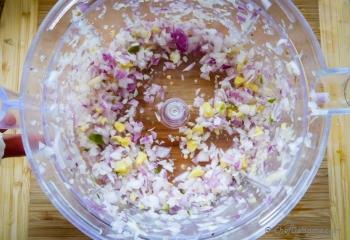 Using food processor, or hand grater, grate onion, ginger, garlic, green chili to a coarse consistency. 2. Heat oil in a wide, heavy bottom saute pan. 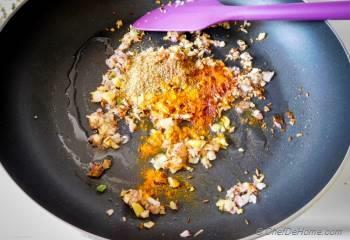 Add cumin seeds, and asafoetida, and let'em sputter for 30 seconds. 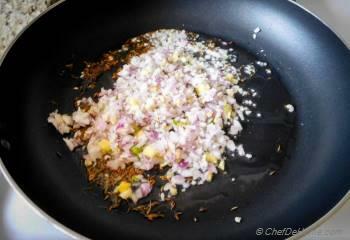 Then add, chopped garlic-onion mixture chopped/grated in Step - 1. 3. When onion starts to lite brown at edges (4-5 minutes), add spices: turmeric, coriander powder, and paprika and cook for 1 minute stirring often. 5. 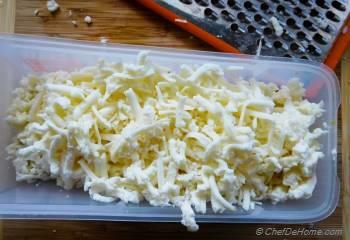 While tomatoes are cooking, grate cheese (paneer) using a coarse grater or chop using knife. 6. 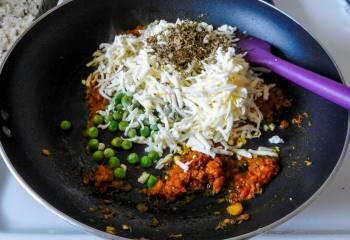 Add grated cheese to cooking tomatoes with frozen pees, and dried fenugreek leaves. 7. Stir to combine and spread in single layer. Let it cook, undisturbed for 2-3 minutes. During this time, water from paneer will dry-off and paneer starts getting caramelize at bottom. 8. Lift a part of paneer to check for crispy paneer layer at the bottom, if you see brown bits of lite caramelized paneer, flip the paneer wide spatula to get similar color on other side (other 2-3 minutes). 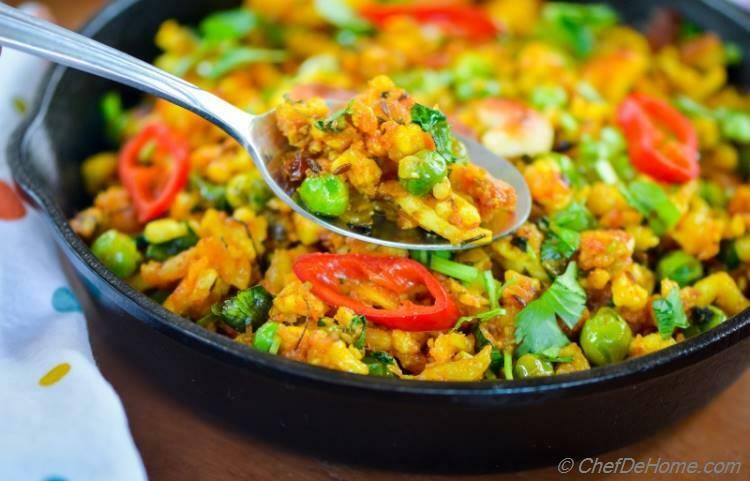 Once moisture has evaporated, increase the heat and stir paneer bhurji for 1-2 minutes. Taste and adjust salt. 9. Remove from heat, garnish with fresh chopped cilantro leaves and toasted cashews(if using). Serve and enjoy! For a good crispy and authentic Paneer Bhurji, make sure paneer has NO soaked-up water. Or wrap paneer in paper towel and put some weight on top to drain water, as much as possible. 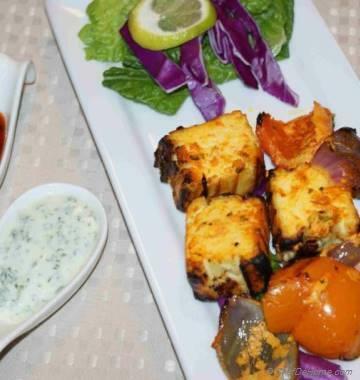 If paneer is very fresh and soft, cut into cubes instead of grating. Very fresh paneer can disintegrate while cooking and will not get crispy. Thanks, Jess! I hope you like it. 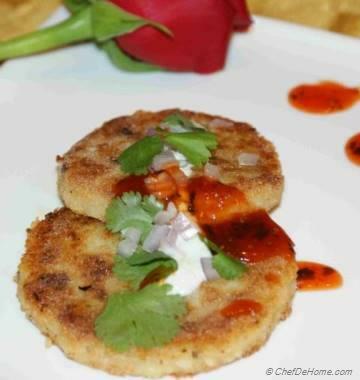 Paneer Bhurji looks absolutely stunning, Savita! I so wish to eat that with gorgeous looking chapati! YUMMY! Anu, thanks! Glad you like paneer bhurji, thanks for stopping by! This dish looks delicious Savita! Love it! And your new picture is very nice! Thanks, Mira! You know, I was thinking since long to change my picture, just got time now. (kinda lazy in these things)...... thanks, my friend, for compliment! Absolutely delicious! One of my favorites, this looks so good Savita!! Manali, thanks for kind words. I'm glad you like it. Love Paneer Bhurji. This is going on my dinner table today, Savita, thanks for recipe! Thanks, Neeli! I'm sure you will love the taste.